A polymath is a person of wide, rather than deep, knowledge. Polymaths love learning and will become engrossed in a subject, often until they feel like they’ve learned enough about that and go off in a different direction. What depth that interest is studied to depends very much on the polymath themselves. Polymaths are above all else curious and have an insatiable need to know about the world and so, finding things they don’t know about, they are inexorably drawn to it. The true era of the polymath was during the Renaissance. It seems that being considered educated during that period allowed you to be an expert in many fields. This was the founding principle of ‘University’ – to become well educated in a wide scope of learning – Universal learning. There wasn’t that idea that we have now, and that the school system encourages, that you can only be good at one thing. The education system now works like a funnel, squeezing people into narrower and narrower specialities. Leonardo da Vinci, my absolute hero, is possibly the best-known; not only a painter and sculptor, he was an inventor, an anatomist, scientist (both biology and physics) and a geologist (and left-handed – another reason he is my hero!). 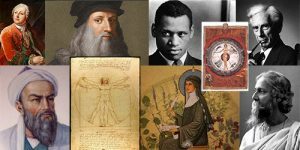 Others who may be described as polymaths include Galileo, Hildegard of Bingen, Abū Rayḥān al-Bīrūnī, Mikhail Lomonosov, Rabindranath Tagore, Thomas Young, Bertrand Russell, Paul Robeson, Jean Cocteau and Isaac Newton – not exactly what you might describe as a collection of ‘Jack-of-all-trades’! Mind you, as any self-respecting polymath will tell you, the saying actually goes “A jack of all trades is a master of none, but oftentimes better than a master of one”. So in this world of specialism is a there role for the polymath? Well, apart from the ubiquitous pub quiz team, there is one talent that polymaths have that specialists in any field will never have – the ability to bring knowledge and information from many different fields and synergise it. The word synergy itself means working together and so perhaps any successful team needs a polymath to bring all their knowledge together, or to translate between specialists because their interest in many different subject matters means that they tend to understand the jargon used in those different areas. This talent for synergy can have major uses in research and development; not least because asking a polymath to research a subject is like giving them a present – the chance to find out something new. Also their interest in just about everything means that they can bring information from different specialisms into the mix. Another thing to remember is that the polymath is the archetypal flexible friend. Job security and the opportunity to join a company and stay there for your entire working life, working your way up through the ranks, is almost extinct, with most experts saying that people will have to change, not just their employer but their career, 5-7 times in their working lives (and in the future it might be as often as every 3years!). The polymath is at a huge advantage in this new world of work because their interests and knowledge are so diverse it will be easier for them to move to another area of expertise. For an employer, having a polymath on your team can also mean that you have got someone who can step into the breach when some new need arises or a gap needs filling fast. They will also be the first to volunteer to take up some new training and learn a new skill.